Enjoy family fun, children’s course, adult or family ride on the beautiful D&L Trail, prizes, basket raffle and Lunch catered by Ateira’s Catering. Bike rentals available on or near site. 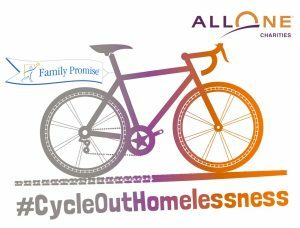 With your help we can #CycleOutHomelessness in Carbon County and the surrounding communities. Family homelessness is an invisible problem because families often sleep in cars rather than park benches. Family Promise of Carbon County provides a safer choice for parents seeking shelter. Through intense case management and support of a network of caring volunteers homeless families transform from nameless faces to shelter graduates in just 45-50 days. Our mission is to spread awareness of the success of the program and raise money for the solutions we have identified. We created this campaign for everyone to contribute at various impact levels. Please share this page with your family and friends.